Many years ago I stumbled across a button dolly and was immediately taken in. Perhaps it was the excitement of having a worthy project for some of the many buttons in my button collection, or perhaps it was the simplicity of the doll that appealed to me. Whatever the reason, I decided to have a go at making my very own version for you to enjoy. Since colonial days women have been making dolls from leftover buttons for their children to play with. These delightful button dolls are still popular today, although are used as decorative items rather than toys. The biggest decision was sorting through some of my button draws trying to decide which buttons to use. The process of making the dolly is quite simple once you get going. And I couldn't resist in making her a primitive style dress and garden hat. The good news is that I have just uploaded my button dolly pattern onto the Stitching Cow website. So click here now and download a copy of the Button Dollly pattern. 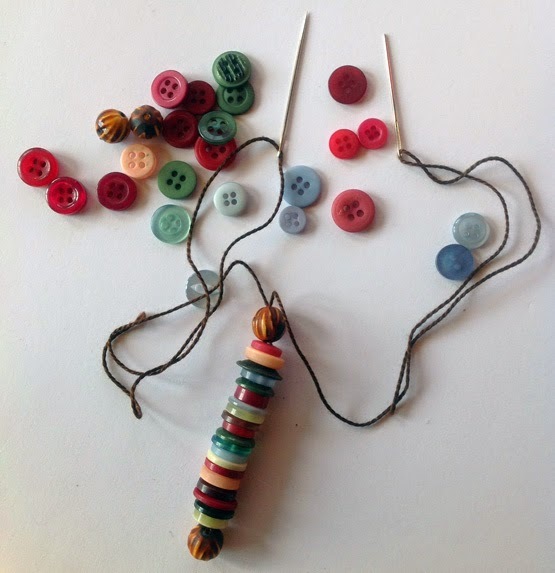 You could be making your very own button dolly today! She is adorable!!! I wish I had as many buttons as you do!!! She is lovely! But I first have to see if there are enough buttons to make her! Most of the buttons I have are dark colors, so I will have to find some lighter ones! wonderful idea! I have lots of buttons in the house that are useless. This is a great idea to utilise that stock and create a doll for my princess.